Follow the Fleet (RKO) is a 1936 Hollywood musical comedy film with a nautical theme starring Fred Astaire and Ginger Rogers in their fifth collaboration as dance partners. It also features Randolph Scott, Harriet Hilliard, and Astrid Allwyn, with music and lyrics by Irving Berlin. Lucille Ball and Betty Grable also appear, in supporting roles. The film was directed by Mark Sandrich with script by Allan Scott and Dwight Taylor based on the 1922 play Shore Leave by Hubert Osborne. 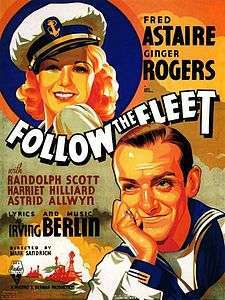 Follow the Fleet was extremely successful at the box office, and during 1936, Astaire's recorded versions of "Let Yourself Go", "I'm Putting all My Eggs in One Basket", and "Let's Face the Music and Dance" reached their highest positions of 3rd, 2nd, 3rd respectively in the US Hit Parade. Harriet Hilliard and Tony Martin made their screen debuts in this film. RKO borrowed Randolph Scott from Paramount and Astrid Allwyn from Fox for the production. Seaman "Bake" Baker (Fred Astaire) and Sherry (Ginger Rogers) are former dance partners, now separated, with Baker in the Navy and Sherry working as a dance hostess in a San Francisco ballroom, Paradise. Bake visits the ballroom with his Navy buddy "Bilge" (Randolph Scott) during a period of liberty, reuniting with Sherry (but costing her job), while Bilge is initially attracted to Sherry's sister Connie (Harriet Hilliard). When Connie begins to talk about marriage, Bilge quickly diverts his attention towards a friend of Sherry's, Iris (Astrid Allwyn), a divorced socialite. The sailors return to sea while Connie seeks to raise money to salvage her deceased sea-captain father's sailing ship. When the boys return to San Francisco, Bake attempts to get Sherry a job in a Broadway show, but fails amidst a flurry of mistaken identities and misunderstandings. He redeems himself by staging a benefit show which raises the final seven hundred dollars needed to refurbish the ship – although he has to jump ship in order to do so. Bilge, now a Chief Petty Officer, is ordered to locate and arrest him, but allows Bake to complete the show. After the concert, Bake and Sherry are offered a show on Broadway, which A.W.O.L. Bake accepts on the proviso that Sherry asks him to marry her. Of course, he first has to be sent to the Brig and take his punishment. Singer Harriet Hilliard was later well known as the wife of Ozzie Nelson and the mother of Ricky and David Nelson, who all portrayed themselves on the TV series The Adventures of Ozzie and Harriet. Hermes Pan collaborated with Astaire on the choreography. Two songs, "Moonlight Maneuvers" and "With a Smile on My Face" were written for the film but unused. "We Saw The Sea": The film introduces Astaire with this song. "Let Yourself Go": Backed by a trio which includes Betty Grable, a nautically-attired Ginger sings this Berlin standard, which is followed, after an interlude (which includes the 'Get Thee Behind Me' song from Harriet Hilliard), by a comic tap duet with Astaire. This routine begins as a competitive challenge between Astaire-Rogers and another couple (Bob Cromer and Dorothy Fleischman, who soon withdraw) and develops into an energetic duet with much emphasis on galloping kicks, leg wiggling and scampering moves. "Get Thee Behind Me Satan": Sung by Harriet Hilliard, this number was originally intended for Ginger in Top Hat. "I'd Rather Lead A Band": After singing this number Astaire embarks on a tap solo in which he dances on, off and around the beat – an ability for which he had long been famous in theatre. After leading the band in the song, he discards the baton and begins the solo part of his routine. After this, he is joined by a chorus of sailors who are alternately led and challenged by him. "Let Yourself Go" (solo dance): This is Ginger Rogers' only solo tap dance in her ten films with Astaire. "But Where Are You? ": Sung by Harriet Hilliard. "I'm Putting all My Eggs in One Basket": As in the "I Won't Dance" number from Roberta, the song is preceded by a solo piano display by Astaire – a playing style he termed his "feelthy piano". Then Astaire and Rogers sing alternate choruses before embarking on a comic dance duet which plays on the notion of both dancers being unable to keep in step with each other. Incidentally, Lucille Ball appears just before this number to put a sailor admirer down with the line "Tell me little boy, did you get a whistle or a baseball bat with that suit". "Let's Face the Music and Dance": Astaire sings this to Rogers after which the dance begins slowly and culminates in a static exit pose. The dance is filmed in one continuous shot lasting two minutes and fifty seconds. During the first take, Ginger's dress, which was heavily weighted so as to achieve a controlled swirling action, hit Astaire in the face midway through the routine, though the effect is barely discernible. He nonetheless selected this take out of twenty overall for the final picture. The set – designed by Carroll Clark under the direction of Van Nest Polglase – is frequently cited as a leading example of Art Deco-influenced art direction known as Hollywood Moderne. Film clips of this routine were featured in the 1981 film Pennies from Heaven – detested by Astaire, – where it was also reinterpreted by Steve Martin and Bernadette Peters with revised choreography by Danny Daniels. Contemporary reviews were positive. "Even though it is not the best of (Astaire and Rogers') series it still is good enough to take the head of this year's class in song and dance entertainment", wrote Frank S. Nugent in The New York Times. "They tap as gayly, waltz as beautifully and disagree as merrily as ever." "With Ginger Rogers once again opposite, and the Irving Berlin music to dance to and sing, Astaire once more legs himself and his picture into the big time entertainment class", Variety wrote in a positive review, although it found the 110 minute running time "way overboard" and suggested it could have benefited from being cut by 20 minutes. "Well loaded with entertainment for mass satisfaction", reported Film Daily. John Mosher of The New Yorker wrote that "Fred Astaire bobs at his best ... I don't think he's done any better stepping anywhere then he does in this picture, and trim little Ginger Rogers keeps up with him all the time." They were enough, Mosher wrote, to overcome the film's excessive length and a plot that lacked "any of the lightness of the Astaire feet." Dance commentators Arlene Croce and John Mueller point out that, aside from the obvious weakness a discursive and overlong plot lacking quality specialist comedians the film contains some of the Astaire-Rogers partnership's most prized duets, not least the iconic "Let's Face the Music and Dance". According to Arlene Croce: "One reason the numbers in Follow the Fleet are as great as they are is that Rogers had improved remarkably as a dancer. Under Astaire's coaching she had developed extraordinary range, and the numbers in the film are designed to show it off." That this film's remarkable score  was produced immediately after his smash-hit score for Top Hat is perhaps testimony to Berlin's claim that Astaire's abilities inspired him to deliver some of his finest work. As an actor, however, Astaire makes an unconvincing attempt at shedding the wealthy man-about-town image by donning a sailor's uniform, while Rogers, in this her fifth pairing with Astaire, brings her usual comedic and dramatic flair to bear on her role as a nightclub entertainer. The film earned $1,532,000 in the US and Canada and $1,175,000 elsewhere making a profit of $945,000. This was slightly down on that for Top Hat but was still among RKO's most popular movies of the decade. ↑ A separate recording exists of Irving Berlin singing this song to his own piano accompaniment, a recording which was featured by Astaire's choreography partner Hermes Pan and rehearsal pianist Hal Borne in the 2004 ARTE documentary l'Art de Fred Astaire. ↑ Satchell, p.251:"I have never spent two more miserable hours in my life. Every scene was cheap and vulgar. They don't realise that the thirties were a very innocent age, and that should have been set in the eighties — it was just froth; it makes you cry it's so distasteful." ↑ Nugent, Frank S. (February 21, 1936). "Movie Review – Follow the Fleet". The New York Times. Retrieved August 14, 2015. ↑ "Follow the Fleet". Variety. New York. February 26, 1936. p. 15. ↑ "Reviews of the New Films". Film Daily. New York. February 19, 1936. p. 4. ↑ Mosher, John (February 29, 1936). "The Current Cinema". The New Yorker. p. 50. ↑ "AFI's Greatest Movie Musicals Nominees" (PDF). Retrieved 2016-08-13. Wikimedia Commons has media related to Follow the Fleet (film).